Tyler Gorman/Staff Photographer Service for Health, Inequality reduction, Natural disaster relief and Education (S.H.I.N.E.) hosts “Instances of Racism on Campus” on Tuesday evening in the University Union. In an effort to reduce inequality and facilitate a discussion regarding racism at Binghamton University, the Service for Health, Inequality reduction, Natural disaster relief and Education (S.H.I.N.E.) hosted “Instances of Racism on Campus” on Tuesday evening in the University Union. From discussing incidents that occurred on campus to sharing opinions on the University’s response to instances of racism, the event aimed to encourage attendees to freely share their views and experiences of racism and inequality. According to Lauren Reyes, treasurer for S.H.I.N.E. and a junior majoring in economics, the discussion was specifically created to foster an environment of education, while making sure these incidents aren’t forgotten. The event was part of S.H.I.N.E. Week, a semesterly series of events that aims to educate students on the organization’s main areas of focus. Angel Tatis, vice president of S.H.I.N.E. 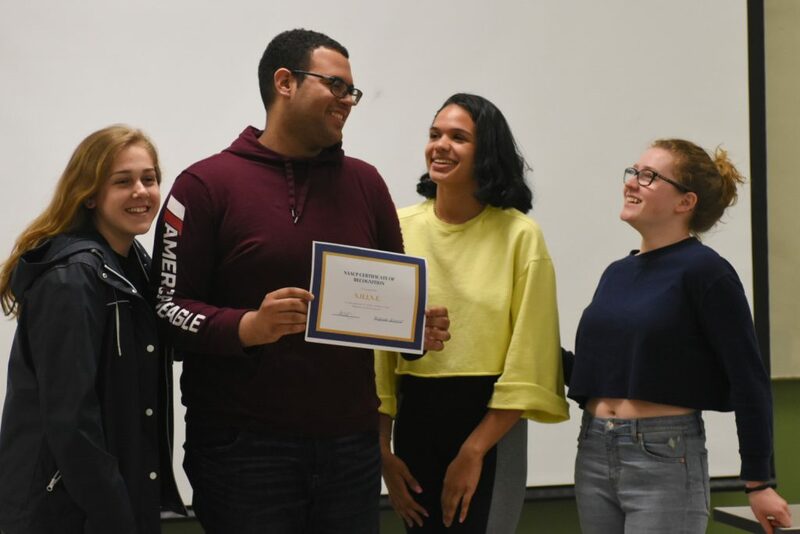 and a junior majoring in linguistics, said the discussion aimed to promote greater awareness of racist incidents and educate students on handling racism. The incidents brought up during the discussion were ones that Reyes and Tatis said have gone unaddressed, including the recent murder of Shakeel Khan, bigoted messages and comics written on whiteboards in Newing College in fall 2017 and last year’s email controversy, when Victor Skormin, a distinguished service professor of electrical and computer engineering, sent a message questioning why a “National Society of White Engineers” did not exist. Students also discussed how well minority students are protected on campus and whether the University provides enough resources for handling hate-related instances. Jessica Mercedes, a junior majoring in Latin American and Caribbean area studies, said the University’s available resources are not enough to produce any effect. Mercedes said she also has concerns regarding how BU administrators, particularly BU President Harvey Stenger, discuss incidents of racism. Ruby McEwen, an undeclared freshman, said tackling these subjects is important for tackling ignorance. Upcoming S.H.I.N.E. events include a discussion on “Operation Varsity Blues,” a college admissions scandal, on Thursday, and a de-stress event on Friday.